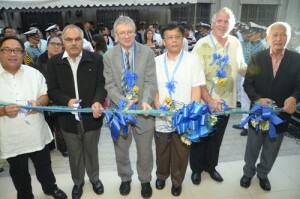 On 17 January 2013, AMOSUP-PTGWO-ITF, a labor organization of 85,000 seafarer-members, inaugurated the Sailor’s Home Annex in Intramuros, Manila. It is the union’s second dormitory facility inside the walled city. The new facility adds another 377 beds to its existing dormitory with 300 beds. The new Sailor’s Home Annex incorporates new and improved features, as follows: Library/Study Hall, Recreation Room, Mini-Gym, Cafeteria/Dining Hall, Infirmary, Open-air Pocket Garden, Comfortable Bunk Beds, Ample Luggage Storage and Individual Lockers. Its design also incorporates “Green Building Technology” such as Water-Cooled Air-Conditioning, Natural Air Ventilation Ducts and Heat-Insulated Roofing and Rain-Water Collection and Recycling System. Such amenities and design make the facility a comfortable accommodation for union members – truly a home away from home. Dr. Conrado F. Oca, President of the union, led invited guests in the ribbon cutting and unveiling of the building marker. Mr. Padraig Crumlin, President of the International Transport Workers’ Federation, Hon. Alfredo S. Lim, the City Mayor of Manila and Hon. Hans Leo J. Cacdac, POEA Administrator representing DOLE Secretary Rosalinda D. Baldoz, witnessed the ceremony as Guests of Honor, along with other guests and industry social partners. Another highlight of the event was the unveiling of the bust of the union’s founder, Capt. 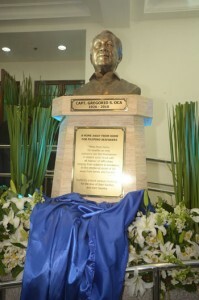 Gregorio S. Oca, who served AMOSUP as President for over fifty (50) years. In his term, he established a host of unprecedented continuing welfare programs for bona fide members, their dependents and the multitude of Filipino seafarers. His immediate family participated in the unveiling ceremony, led by his widow Mrs. Mercedes F. Oca and his brother, Dr. Oscar S. Oca. In Dr. Oca’s message, he fittingly dedicated the new Sailor’s Home Annex to Capt. Oca and to all hardworking members who have dutifully and untiringly served the maritime industry. The event was culminated by messages from the guests and social partners. All attendees, including ITF Dockers delegates and AMOSUP members, enjoyed the sumptuous dinner and the pleasant entertainment that followed the program proper.